If you can’t help out through tangible donations, look for a way you can show compassion within your circle of influence today. And tomorrow. And every day after that. You don’t know what greater good might come tomorrow from your tiniest act of kindness today. Green Bambino, the cloth diapering store, is taking donations of disposable baby wipes, disposable diapers and baby formula. Dignity Memorial® network of funeral, cremation and cemetery providers is making its Compassion Helpline® available at no charge to the families and friends of the victims, as well as other community members affected by this event. The toll-free number designated for use by members of the Oklahoma City-area communities and their families is 1-800-854-8080. Free grief materials are also available. 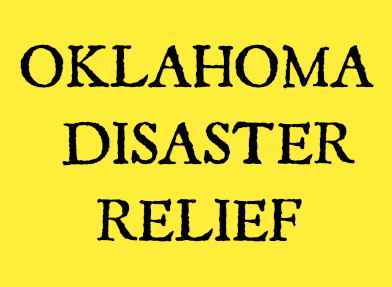 Old Try will donate $6 to the relief effort from any Oklahoma T-shirt sales. The Okay See will donate to the relief effort 100% of these T-shirt sales. Memorial Road Church of Christ has a list of accepted donations as well as ways you can get directly involved with the disaster relief. Call (405) 478-0166 if you know families or individuals who need help at their property. Oakcrest Church of Christ, 1111 SW 89th Street, Oklahoma City. (405) 631-5534. The church has set up a shelter for storm victims and is receiving relief supplies.